A couple weeks ago, we gave you the heads-up, folks. The AIGA 100 Show is upon us once again, and we gave you a good look at the judges in action. There they were, the venerable three--Nicole Flores, Ben Johnson, Drew Melton--pouring over some of the best design (print, web, motion, etc.) that our fine state has to offer. This is how it goes. Each year, hundreds of applicants throw their proverbial hats into the ring, after which the aforementioned artistic umpires sift through, size-up, scrutinize, and otherwise stamp each entry with the mark of excellence. Exhausting, no doubt...but this, friends, is how you find the crème de la crème in the vast pool of Utah's design world. 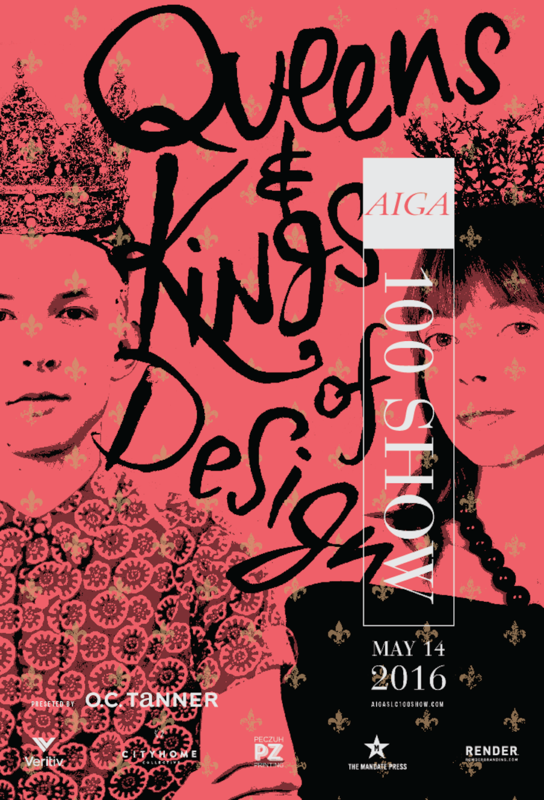 What's featured in the upcoming AIGA 100 Show (the 27th annual, themed "Queens & Kings of Design") marks the tip-top pieces…the 100 stand-out entries, which will receive "Awards of Excellence." Those in attendance will get to see the "fruits of many-a-laborer…which have been hand-plucked by the judges selected." One of the evening's highlights will include the presentation of just 7 Copper Ingot Awards--awarded to the few, top-shelf professional entries--and 3 Student Copper Ingots. But the AIGA 100 isn't just a stodgy awards show…noooo, no. It's a gathering of creative minds, mixed media, and those that appreciate it all, combined with cocktails, music, food, and friendship. Sounds magical, right? It really is. This is your chance to see the best of logos, websites, packaging, branding, and graphics of all type. Our city/state's design elite, justly recognized and paraded publicly…which is precisely as it should be. Join AIGA, title sponsor O.C. Tanner, and some legitimately talented people for a night of all the good stuff. Details and sponsors can be found on the flyer below, or you can click the link to secure your tickets. Sensational design is worth everyone's support.